After 24 years at the helm of Hydrosphere, Andy Reid hoists the mainsail and heads for retirement. Finding a calling for the sea when aged just 17, former merchant navy officer Andy’s strategic vision took Hydrosphere through rough seas all the way into the 21st century. 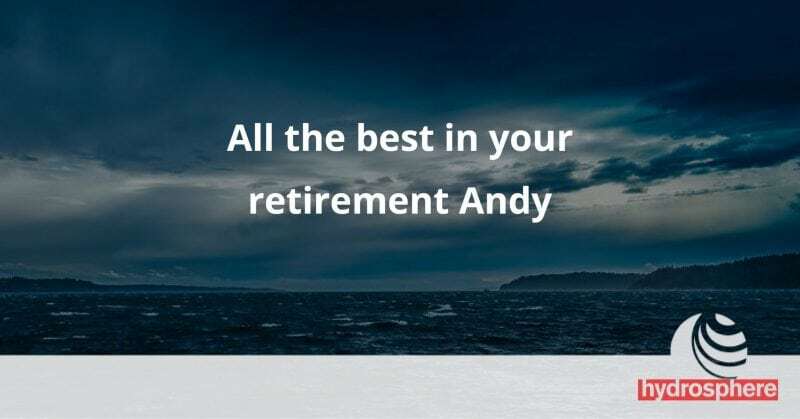 With his company carving a reputation in the ultra-competitive marine industry for excellence in product quality and sales services we spoke to Andy about his thoughts on retirement and being a maritime entrepreneur. What makes Hydrosphere different to the other suppliers? You’ve got a telling accent – growing up in Edinburgh. How did you end up in the South East? “I was brought up near Edinburgh and went to school in Fife. After I left the Merchant Navy, it was tough finding a job in Scotland and I ended up moving to Rugby to work for GEC selling dynamic positioning systems. GEC was really interesting as the products we were selling were state of the art and selling to the oil industry was a challenge. However, working for a large organisation didn’t suit me and I left to work for a smaller company. I had a few jobs mainly selling oceanographic and hydrographic monitoring products before I decided that I really wanted to work for myself. What’s a stand out moment for you over the years? “The early years were tough, and it took a long time before we felt we were properly competing against some of the well-established companies. A stand out moment would be when the sales manager of one of those established companies told me that we were considered the biggest company in terms of sales of navigation lights and buoys in the UK. One last thing, your ‘desert island’ question – just for fun, you’re stranded at sea. What’s the ideal rescue vessel you’d like to see pulling up?